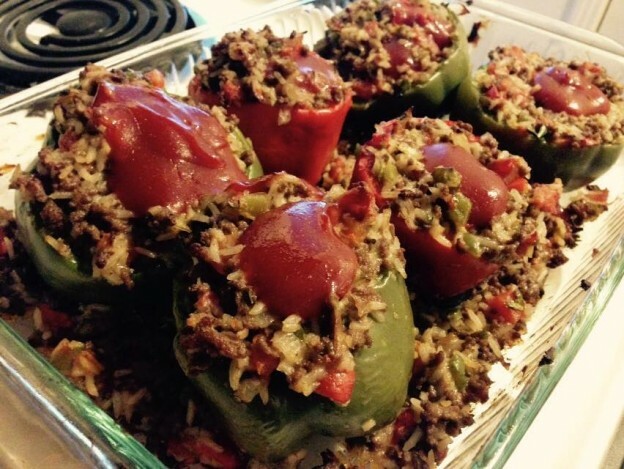 ½ cup Minute Rice that has been pre-cooked and set aside to cool. Bring 4 quarts salted water to a boil in a large pot over high heat. Add the peppers to the boiling water and cook until the peppers just begin to soften, about 5 minutes. Using a slotted spoon, remove the peppers from the pot, drain off the excess water, and place the peppers upside down on paper towels to dry. Adjust an oven rack to the middle position. Heat the olive oil in a large heavy skillet over medium-high heat until oil is shimmering. Add the onion and the diced pepper. Cook, stirring occasionally until onion and pepper are softened and onions are beginning to lightly brown, about 5 minutes. Add the ground beef, breaking beef into small pieces with a spoon. Cook until beef is browned. Make a well in the center of the meat mixture and stir in the garlic and pepper flakes. Cook until fragrant, about 30 seconds. Mix garlic well into meat. Again, make a well in the center of the meat mixture and stir in the bouillon. Deglaze the entire pan with the red wine and remove meat mixture from heat. Add the cooked rice, drained tomatoes, cheese and the parsley to the meat mixture and combine until cheese is fairly well melted into the mix. Salt and pepper to taste. Stir together the ketchup and the reserved tomato juice in a small bowl. Place the peppers, cut side up, into a large casserole or baking dish that has been sprayed with cooking spray. Using a soup spoon, divide the filling evenly among the peppers, pressing down with the spoon (or fingers) as you go to compress mixture into each pepper. Slightly over-fill each pepper. Line the baking dish around the peppers with any remaining meat mixture. Spoon 2 tablespoons of the ketchup mixture over each filled pepper and drizzle remains over mix in the dish that is outside the pepper cups. Bake until the filling is heated through, about 30 minutes. Serve immediately.